Chandelier cells, a group of powerful inhibitory neurons, are important in epilepsy and schizophrenia. Cold Spring Harbor, NY - January 17, 2014 - Chandelier cells are neurons that use their unique shape to act like master circuit breakers in the brain’s cerebral cortex. These cells have dozens, often hundreds, of branching axonal projections – output channels from the cell body of the neuron – that lend the full structure of a chandelier-like appearance. Each of those projections extends to a nearby excitatory neuron. The unique structure allows just one inhibitory chandelier cell to block or modify the output of literally hundreds of other cells at one time. Without such large-scale inhibition, some circuits in the brain would seize up, as occurs in epilepsy. Abnormal chandelier cell function also has been implicated in schizophrenia. 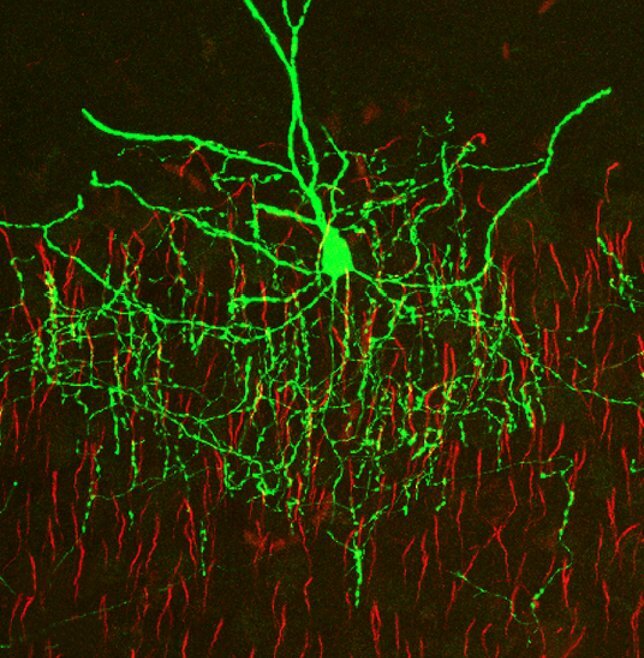 Yet after nearly 40 years of research, little is known about how these important inhibitory neurons develop and function. In work published today in Cell Reports, a team led by CSHL Professor Linda Van Aelst identifies two proteins that control the structure of chandelier cells, and offers insight into how they are regulated. To study the architecture of chandelier cells, Van Aelst and colleagues first had to find a way to visualize them. Generally, scientists try to find a unique marker, a sort of molecular signature, to distinguish one type of neuron from the many others in the brain. But no markers are known for chandelier cells. So Van Aelst and Yilin Tai, Ph.D., lead author on the study, developed a way to label chandelier cells within the mouse brain. Using this new method, the team found two proteins, DOCK7 and ErbB4, whose activity is essential in processes that give chandelier cells their striking shape. When the function of these proteins is disrupted, chandelier cells have fewer, more disorganized, axonal projections. Van Aelst and colleagues used a series of biochemical experiments to explore the relationship between the two proteins. They found that DOCK7 activates ErbB4 through a previously unknown mechanism; this activation must occur if chandelier cells are to develop their characteristic architecture. This work was supported by two grants from the National Institutes of Health. “Regulation of Chandelier Cell Cartridge and Bouton Development via DOCK7 Mediated ErbB4 Activation” appears online in Cell Reports on January 16, 2014. The authors are: Yilin Tai, Justyna Janas, Chia-Lin Wang, and Linda Van Aelst. The paper can be obtained online at: http://cellreports.cell.com. Photo courtesy of CSHL. Chandelier cells (seen in green) use their remarkable branching architecture to inhibit hundreds of excitatory neurons (in red) in the brain. CSHL researchers have identified two proteins that control the structure of chandelier cells, offering insight into how these cells are regulated. Subject: LongIsland.com - Your Name sent you Article details of "Scientists Discover Two Proteins that Control Chandelier Cell Architecture"